The days of ‘buyer beware’ are over. Today it’s ‘seller beware,’ as customers—empowered by technology—share their service experiences. That means every experience must be personalized and consistent across channels and throughout the customer journey. Get it right and you’ll be rewarded with increased revenues and lifelong customers. Get it wrong and 89% of customers will stop doing business with you after one bad experience. So how do you deliver the tailored, seamless service customers demand? 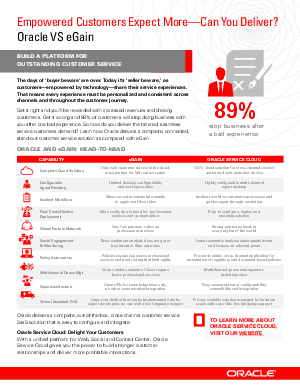 Learn how Oracle delivers a complete, connected, stand-out customer service solution as compared with eGain.